Background Theory: How Does a Voltage Regulator Work? The name says it all: voltage regulator. The battery in your car that gets charged from the alternator, the outlet in your home that provides all the electricity you desire, the cell phone you likely keep on-hand every minute of the day they all require a specific voltage in order to function. Fluctuating outputs that jump from ±2V can cause inefficient operation and possibly even damage to your charging devices. There's a variety of reasons why a voltage fluctuation may occur: condition of the power grid, other appliances turning off and on, time of day, environmental factors, etc. 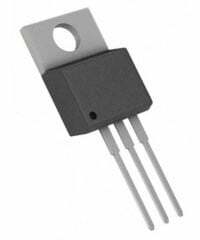 Due to the need for a steady, constant voltage, enter the voltage regulator. A voltage regulator is an integrated circuit (IC) that provides a constant fixed output voltage regardless of a change in the load or input voltage. It can do this many ways depending on the topology of the circuit within, but for the purpose of keeping this project basic, we will mainly focus on the linear regulator. A linear voltage regulator works by automatically adjusting the resistance via a feedback loop, accounting for changes in both load and input, all while keeping the output voltage constant. Switching regulators, on the other hand, such as buck (step-down), boost (step-up) and buck-boost (step-up/step-down), require a few more components as well as an increased complexity of how various components will affect the output. 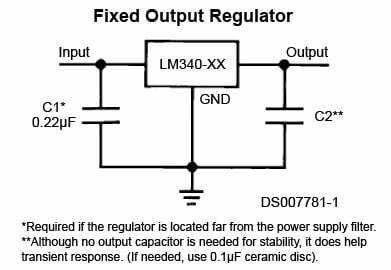 Switching regulators are far more efficient in terms of power conversion where efficiency plays a big role, but linear regulators work very well as voltage regulators in low-voltage applications. Depending on the application, the voltage regulator may also need greater focus improving other parameters, such as output ripple voltage, load transient response, dropout voltage and output noise. Applications like audio projects are more sensitive to noise and interference, so extra filtering will be required, especially in switching regulators where the output ripple can be significant. Most of the information, including schematics, can be found on the datasheet of the voltage regulator IC you are working with under Application Notes. Afrotechmods also has an informative video on working with the popular LM317T voltage regulator to get an adjustable output. 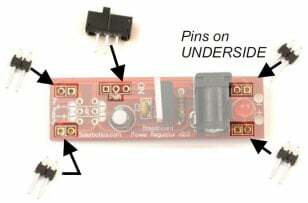 The Breadboard Voltage Regulator Kit is great soldering kit for any beginner. 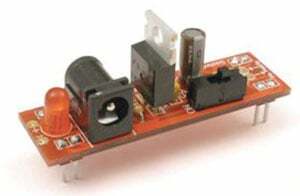 It outputs a clean 5VDC with a maximum output current of 500mA. It is able to take an input voltage range of 6-18VDC and has pins that are perfectly sized to fit on any standard breadboard with 0.1 inch spacing. Remove the tape and bend the leads of the resistor over, then insert it into the position labeled R1. Solder it in from the other side and snip the excess leads. Do the same for the 0.1µF capacitor into position C2. It doesn't matter which way these parts are installed – they are not polarized. 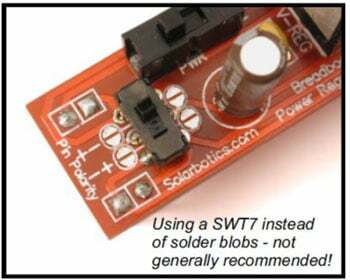 Solder the voltage regulator to the V-REG position. Make sure the tab-side aligns with the fat line on the symbol – backwards won't work! Next, trim off the excess leads. Snap the barrel jack into position B1 and solder it into place. 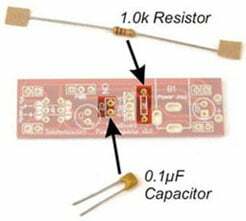 Install the 10µF electrolytic capacitor into position C1. Positioning is critical. Make sure the longer lead goes into the pad marked (+). Confirm it's in the right position by checking that the stripe on the side of the capacitor is nearest to the PWR label. 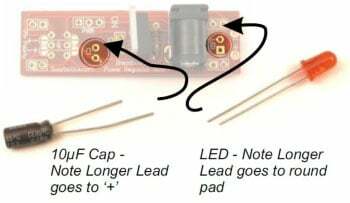 Do the same with the LED; the longer lead goes into the round pad. You can confirm the LED is in the right position by noting the little notch on the LED is on the side of the LED symbol with the line (near the square pad). The power switch simply mounts into position PWR. The breadboard pins are a bit more difficult – they go on the underside and are harder to hold while soldering. Carefully solder them in as straight as you can by hand, or if you are confident, push the long side of the pins into your breadboard so that they match the holes in the PCB, then solder them in while the breadboard holds everything in alignment. THIS IS IMPORTANT. If you forget to do this, your board won't work! 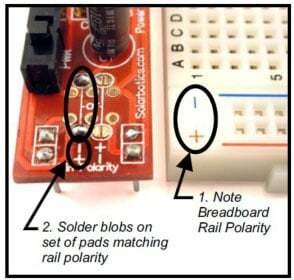 Choose which side of the breadboard you want your board to mount (in this example we use the left side). Note the polarity of the breadboard rails '+' on the bottom and '-' on the top. Find which set of pads on the board match this arrangement and put a blob of solder across the little half moons. If you plan to switch the polarity of the power on the rails, you can mount part number SWT7 on the pads between the blob pads. Do not put any blobs on the pads if you do this. Note that this is not a recommended modification. Power your board with any 2.1mm DC power source rated 6-18V – do not exceed the 35VDC max! The power regulator will warm when powered with over 12V (that's OK). 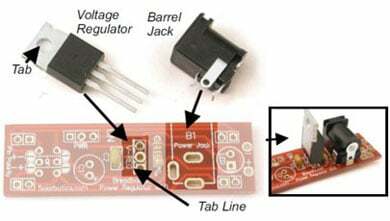 If you don't want to use it on a breadboard, use the solder pads labeled "+ -" on the end nearest the barrel jack for 5V regulated power output. 1. What effects will heat and noise have on the output of the circuit? 2. How do capacitors help filter out interference issues? 3. What are some advantages and disadvantages for both linear and switching regulators?